Every Year at Christmas Time I Miss My Friend, Mel Torme. I’m never sure exactly when it’s going to happen, but every year at sometime during the Christmas season I realize how much I really miss my friend, jazz singer Mel Torme. Mel knew more about the mixing of cord harmonies than anyone did before or has since. He was the one who taught that art to bandleaders Les Baxter and Artie Shaw, and singers Ginny O’Connor (Henry Mancini’s wife), the Hi-Los and the Manhattan Transfer. He’s the one who wrote the arrangements for Chico Marx’s band when Mel was but a teenager. And no one sung the songs of Christmas with more interpretive passion than Mel, even though he was Jewish. Mel’s also the one my business colleague of twenty-plus years ago, Carol Todreas, and I tromped on many bitter-cold snowy nights from our Central Park South hotel to a small jazz club on Manhattan’s east side called Marty’s, to hear him front the George Shearing Trio, in a packed house that held no more than 70. Marty’s was carved out of the first-floor corner of a multi-story parking garage. It was New York City’s best kept secret. No way did the owner make any money, and it’s for sure Mel and Shearing were working for not much more than a free meal. But for them it was the perfect gig. For the audience it was the venue of succes d’estime. Mel Torme wrote the tune and most of the words to the Christmas song that goes, “Chestnuts roasting on an open fire. Jack Frost nipping at your nose.” And he did it when he was just 22-years old. 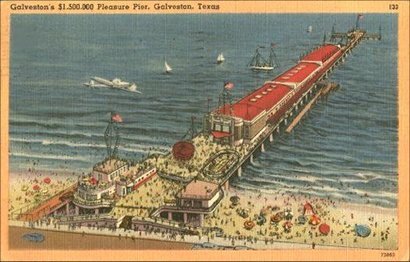 The following summer he appeared to a packed house in the Marine Ballroom at Galveston’s Pleasure Pier. And he had one successful appearance after another at the Island’s Balinese Room, although his name never seems to be included in the list of the B-Room’s star performers – entertainers like Phil Harris, Myron Cohen, Frank Sinatra and the like -- when someone speaks or writes about those days. Every year symphonies give their annual Christmas Pops concerts. The houses are always packed. But interestingly, when you look around to see who’s in the audience, you would think that every senior citizen within a fifty-mile radius was there, while the young people were obviously somewhere else. The orchestra plays arrangements of many of the favorites – Adeste Fideles, Little Drummer Boy, Deck the Halls, O Come All Ye Faithful and so on. I remember that one time the vote on my wife, Patty’s, and my row was that a Davis/Custer arrangement of Silent Night was the best. And that time like every other time, while the orchestra and the rest of the audience moved on in the program, they left me behind, as they always do, to think of Christmases of the past when Mel was still singing his songs, Carol and I were tromping through the Manhattan snow to hear him at Marty’s, and all of the members of the Cherry family were still alive and together awaiting the wonderful celebration of Christmas. Those are all of the reasons in the world for me to miss Mel Torme.